I have previously referred to coffee as an art. This is a fair comparison but, like art, sometimes you only wish for a small portion. Not everyone wants to visit the gallery all day, sometimes you just want to see the one painting and get back to your life. Same with coffee – with most coffee makers, you are forced to make an entire pot of coffee at a time. This would be fine if you were serving coffee for an entire office, but what about those late night 2 AM coffee sessions. It’s just you and your machine, desperately trying to not wake anyone with the sound of your bean grinding. But, sadly, the leftover coffee betrays you – even after drinking one and a half cups, the rest of the pot still sits there, incriminating you! With the Hamilton Beach 49995 FlexBrew Single Serve Coffeemaker, this isn’t a problem. 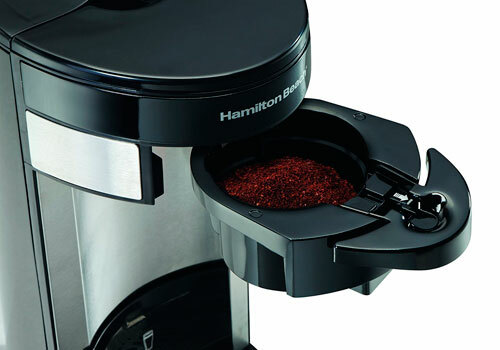 It is designed with a specialized method of brewing specifically created to make one cup at a time, the Hamilton will ensure that no one will discover your habit if you don’t want them to. 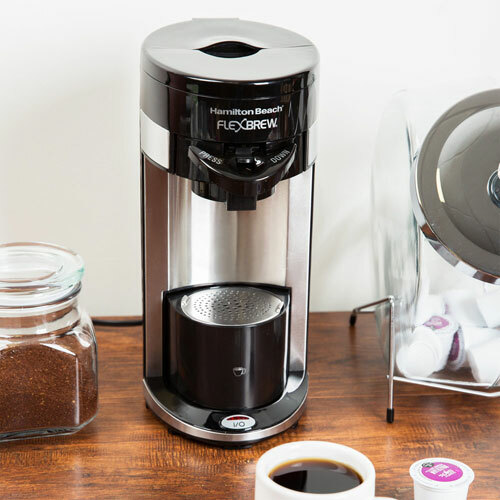 With this machine, speedy, reliable coffee is only a button push away. 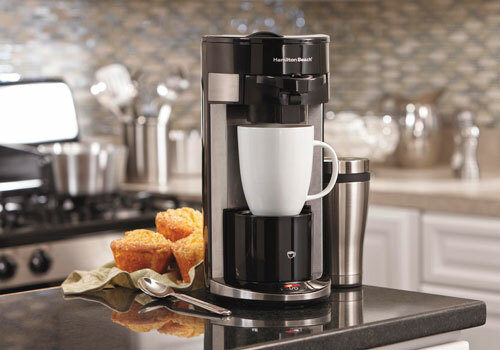 Hamilton Beach Flex Brew is one of the best coffee maker available in the market. So in this Hamilton FlexBrew review, let’s take a look at how this product stands up. The beauty of this coffee machine is in its ease of use. The entire machine is designed to be incredibly easy to use, clearly understood and operate with maximum speed. Everything works quickly and efficiently, making exceptional coffee. It is always very helpful to have a clear, concise list of the features of a product when considering whether to buy it, so let’s take a look at what the Hamilton Beach coffee makers has to offer. 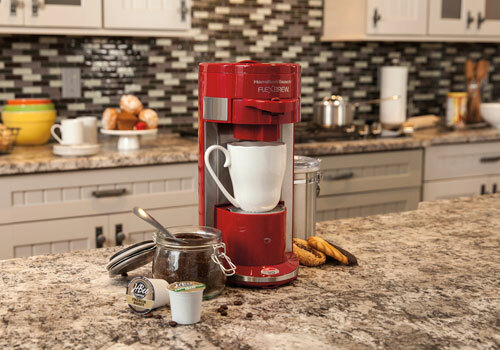 The Hamilton coffee maker is primarily designed for a quick and easy cup of coffee. However, many people understand that making one’s own coffee provides the superior experience. In light of this, Hamilton offers a steel mesh scoop filter that allows you to use your own ground beans, as well as individually prepared different assortments of blends of coffee. This is an excellent feature, as it shows that Hamilton understands that people don’t just want one thing from their machines. Sometimes, users want a single cup of pre-made, easy coffee, whereas other times you desperately crave your own unique blend of important Himalayan coffee. The FlexBrew coffee maker allows for both. 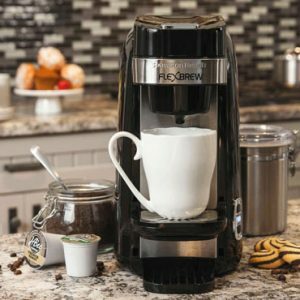 The FlexBrew offers something that is quite unique in comparison to other coffee makers: the ability to make tea! In most machines of this sort, you’ll find that they can only produce precisely what they’re designed for; you use a single serving of pre-made coffee, or you buy another machine. 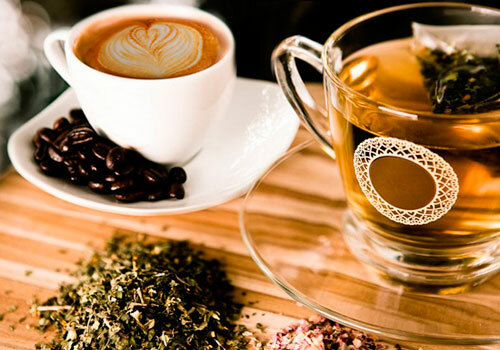 With the Hamilton Beach coffee maker, however, you are able to instead use tea pods, as well as utilize other flavorful blends to create your own tea experience. This is incredibly important for two reasons: Firstly, it ensures variety in your drinking routine – sometimes you just want a cup of tea! Secondly, it cuts down on additional machines. With the ability to make tea easily, you won’t need a kettle or other contraptions necessary to make tea; you can just use your Hamilton! Hamilton understands that, sometimes, you desire a cup coffee in the dead of the night. Bleary eyed, groggy and totally blind, you stumble to your coffee machine on the hunt for precious caffeine. However, alas, it is too dark to measure out the coffee! Luckily enough, Hamilton FlexBrew coffeemaker has easy markings to measure out quantities. No longer will you need to drop coffee grounds and hot water across your kitchen floor in the dark. One of the great frustrations with coffee machines is the irritating lack of customizability. Very frequently one needs to fill a travel mug to take to work so as to be able to survive their day. With most machines, this means making a cup of coffee, then haphazardly pouring it into a travel thermos, spilling horrendously hot liquid all over yourself. Perhaps you might try pouring it into a measuring jug and pouring that into your thermos. It won’t matter. It will all end badly. With the Hamilton Beach coffee maker, this isn’t a problem – you can adjust the cup rest to accommodate for travel mugs, espresso-sized teeny tiny cups or even that giant ceramic pint mug you bought on holiday in Morocco. No matter its size, you can just pop your mug in there and get coffee on demand. Incredibly handy! The FlexBrew coffee maker is designed to be used quickly and on the go. This might, with other machines, necessitate an enormous amount of mess. With the Hamilton, it is so incredibly easy to clean that it deserves a special mention as a feature. The entire machine breaks down into easily removable parts; you can seamlessly clean individual bits with nothing more than running water and a cloth. 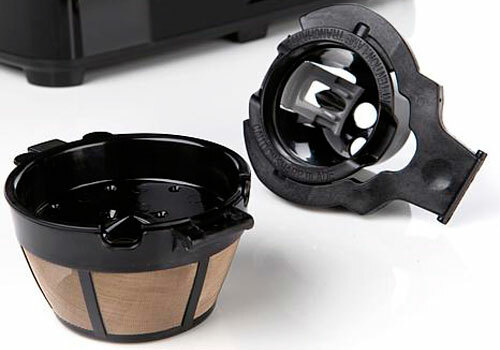 The steel mesh K-cup holder is conveniently removable, sleek to look at and incredibly easy to quickly clean. This is all the more important for a working coffee machine. Note that when I say “working“, I don’t mean that it turns on. I mean that the Hamilton is not designed to sit in your kitchen looking pretty and taking up space. This machine exists to be used every day flawlessly. Thus, easy cleanup is a prime feature that necessitates its own mention. When I want a quick cup of coffee, I don’t want to worry about any kind of cleaning afterwards. 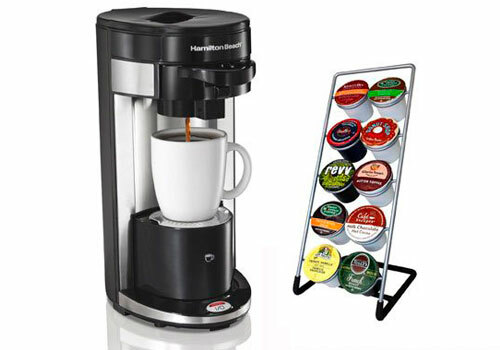 Although this fits under the aforementioned flexibility of coffee choice, it is a special machine indeed that allows you to both use normal K-Cups as well as home-ground coffee. The significance of this cannot be understated. You are able to, when desired, use your own ground coffee. Maybe you ground it yourself? Maybe you bought it from a mystical monk from the jungles of Tibet. It doesn’t matter – if the inkling strikes you, you can utilize the steel mesh scoop and measure out your own, customized perfect amount of coffee. In a world with an endless sea of coffee machines available, it seems that the majority enforce one type of coffee production on you. Either you can only use K-Cups, or use pre-ground. With the Hamilton Beach coffee maker, the choice is returned to you; it’s up to you how creative you want to be with your coffee. Want an easy, quick-to-work coffee? Use a K-Cup. Desire something spicy and exotic, matched to your own personal tastes? Then use your custom blend with the mesh filter. It’s honestly incredibly refreshing to have the choice. Having a list of fantastic features is helpful, but it’s always great to be able to take a look at the areas it could improve so as to compare it properly. Informed decisions are the best decisions! Let’s take a look at some pros and cons! The reason Hamilton Beach coffee maker is an excellent choice is because of the simplicity of what it provides. This machine is entirely designed around speed and simplicity. Ease of use is paramount when you are attempting to get your coffee quickly to go to work. Most machines, they force you to go through innumerable steps to create a basic cup of coffee. Either that, or they limit you to only use pre-made packages, utterly devoid of creativity. With the Hamilton FlexBrew coffee maker, you get the ease of use of a quick-to-use coffeemaker, combined with the customizability of a more expensive machine. What makes this even better is the excellent price tag. At this low price, you get something you can use everyday that works quickly, that works to your liking and to your specifications. By far the best feature of this machine is the ability to customize the entire experience – your cup size, quantity amount or even the type of coffee (or tea!). Remember that a purchase of a coffee maker is something you will use every day (most likely, who are you kidding?) and expect to work reliably. With these specifications in mind, you can’t go wrong with the Hamilton Beach FlexBrew single serve coffeemaker. Coffee should be easy. Coffee is a science, yes, as well as an art. But, that doesn’t mean it needs to be needlessly complex. 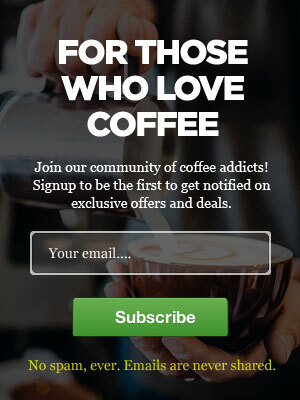 Too often I see coffee machines with an air of mysticism about them – either you’re expected to utilize archaic, divine rituals to get your caffeine fix, or you’re supposed to innately know how to use whatever crazy new features exist on the latest brand. But this is entirely optional. You’re not forced to learn a variety of new mythological tricks just to make a simple cup of coffee. 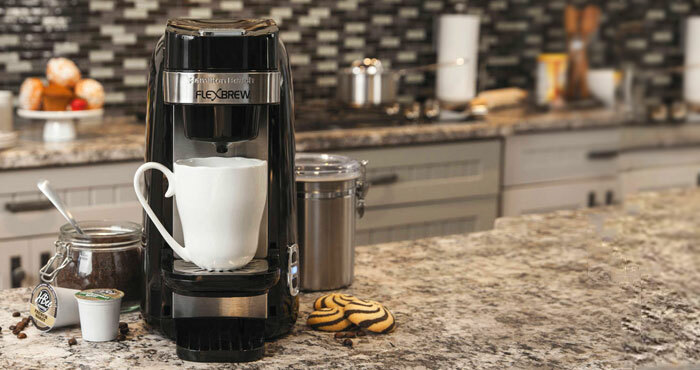 With the FlexBrew coffee maker, if you want to, you can just add your cup, add the coffee and press a simple, elegant button. Then, within a few minutes, you have coffee directly into your cup. It literally couldn’t be simpler. Hamilton Beach 49995 FlexBrew Single Serve Coffeemaker was reviewed by Tim Forman on May 1, 2018. *Disclaimer: Our Hamilton Beach FlexBrew review is based mostly on our expertise and the experts we consulted with and the information provided by the manufacturers. We do test many products, but it’s not possible to test them all. As such, please remember the above recommendations are our opinions, and before using any product, please check manufacturer’s website for more information. Cleaning Hamilton Beach FlexBrew is relatively easy but there are few things you should know. Check this great video which shows how to clean Hamilton Beach coffee maker. 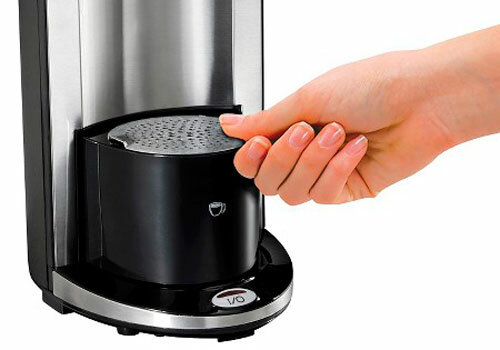 It is an awesome coffeemaker and it is so easy to use. I suggest you get it, try it, and I am sure you are going to love it too. This coffeemaker is the best!! !